We decided to share more details on our spring charity experience. Redwerk team hopes this little story will encourage you to help, donate or take part in some charity campaign. Cause helping is easy, and there are so many ways to support those in need. Just give it a try. 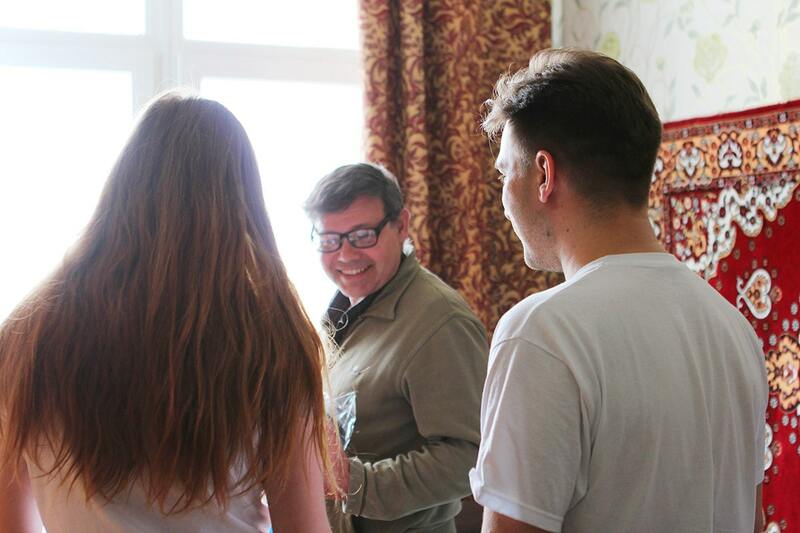 Charity giving in Ukrainian IT companies: Redwerk’s experience and reflections on the subject. With IT being among Ukrainian industries with the highest level of income, no wonder we, at Redwerk, once found ourselves thinking about social responsibilities. You often see people helping kids: patronizing orphanages, sponsoring treatment and medications for sick children, buying clothes and food. But what about the oldest members of our society? What do you feel each time there is a senior begging in the street instead of spending their golden age in decency surrounded by a loving family? Unfortunately, it’s a very common sight in our country. Despite the fact Ukraine is a social state on paper, reality differs. Lone seniors often cannot afford their living from what the state compensates them for decades of hard work. 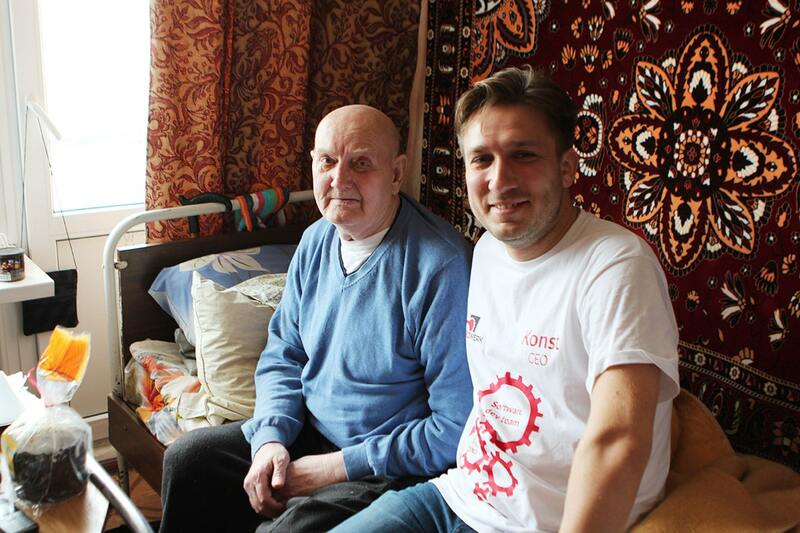 If not for family, one would starve on an average Ukrainian pension of less than $40 a month. But what if there is no family to take care? Doing our research, we came across the “Let’s Help” charity that specializes in this particular area, helping seniors in state-owned nursing homes. These institutions are often underfinanced with state payments delayed or cut, and generally doing not so well. What built our trust was that they don’t use any part of donations they collect for their own operations. These are paid by their patron organization, the media agency Liga.net. As our first charity project, we put boxes for donations in every Redwerk’s R&D office and then doubled the amount at company’s expense. We’re now proud to say that the initiative gained active support from our team. But we also realize the need to thank our customers from all around the globe: USA, Ireland, Germany, UK, the Netherlands, Australia. It’s your business that gave us the means to help seniors in need in our country. You may be Catholic, Orthodox, Jewish, Muslim or atheist. The only thing that matters here is your will to help. 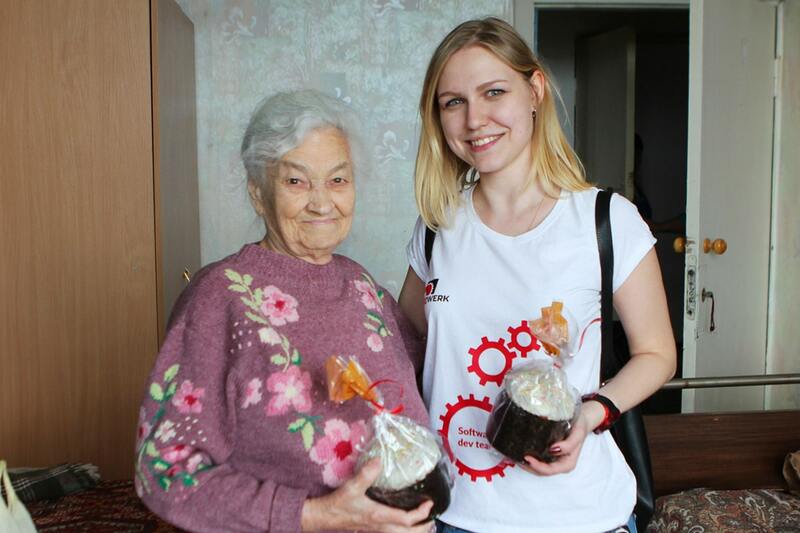 So, on Easter Day 2017 we visited a house in Rzhyshchiv that takes care of almost a hundred of elderly and disabled people who need support and everyday help. We’ve tried our best to share at least few minutes with every single resident, hold them by the hand, listen to their stories, hear their needs. And now we want to share some of them with you. Yuriy, 66. Moved here in April, 2017. According to his grandchildren, Yuriy is a retired Colonel General. Currently in litigation, trying to prove he really did military service and holds the above-mentioned rank. The case files don’t have any documentary evidence included, though. Yuriy prefers to spend his spare time reading and communicating with other residents. He’s a great conversationalist. Vyacheslav, 47. Resident since 2014. Vyacheslav was the youngest person we met there. Unfortunately, being a disabled person of group I, he’s completely unable to speak. Despite that, Vyacheslav is very friendly, a lover of nature and all creatures great and small, especially dogs. Mykola, 62. Lives here since 2013. 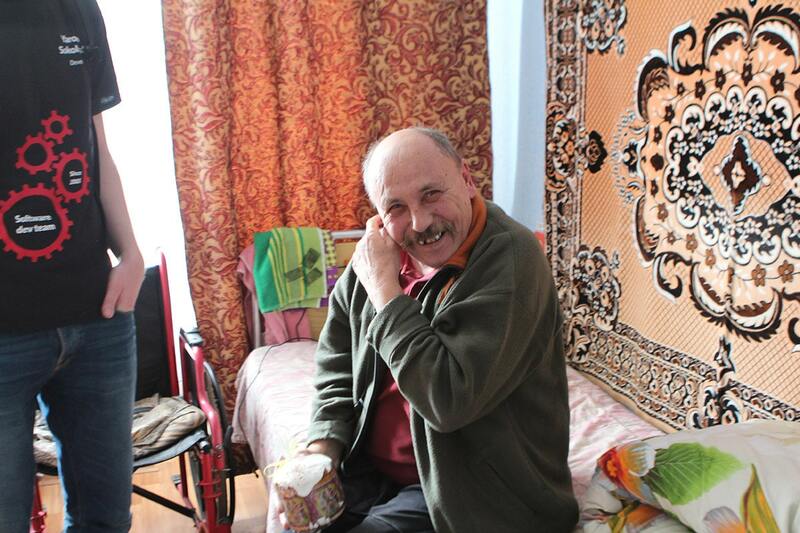 Now a disabled person of group I, Mykola used to be a police officer. He goes with the times, is tech savvy and has many online friends. Mykola keeps trying to engage other residents into online communication and promotes computer knowledge. Maria, 91 has been a nursery home resident since 2014. Maria reads a lot, prefers historiography, and is an active library reader. Besides, she’s really into handicraft and, being good at knitting, supplied lots of warm knit socks to Ukrainian ATO forces. Maria is a former factory worker and a Leningrad Blockade survivor. The truth is simple: age, illnesses and loneliness are very likely to become your good friends regardless of who you were in the past, who you are now and what your social standing will be in the future. But, being a part of modern society, you’re still able to make things change. Just don’t forget we’re here to help and support those in need, not to neglect. We saw seniors react to our questions and smile at the small sweet presents we handled. It was both heartbreaking and inspiring. Even little help makes a difference and every one of us can brighten someone’s day. If you’re an IT company or a business specializing in any other field, if you approve what we did that day, don’t hesitate. Helping is easy. Teams are a powerful resource: at a modest cost of one lunch per person (in Redwerk’s case these are sponsored anyway) and, if you decide to double the collected funds, at the cost of one week’s office supplies, you can make a difference. Choose any charity you trust and make a donation. And don’t forget to actually visit your paternalized and see their happy faces — it’s a great feeling.